The Dragon Touch R10 is an entry-level tablet that is priced for the consumer first dipping their toes into the world of mobile computing. What the R10 does, it does well. 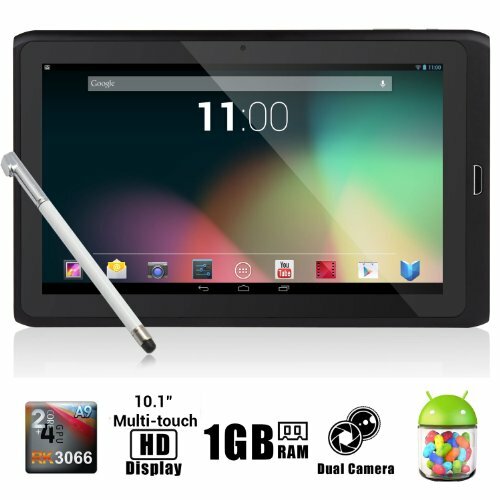 The Dragon Touch is a new line of Android tablet and it is priced to make a difference in the mobile computing marketplace. Let’s take a look at what all the Dragon Touch R10 does well, what it doesn’t do so well, and if it is the right tablet for you. We declare this to be the best 10 inch tablet for your money. It beat out the other low price Android contenders offering more value. Comparable standard size USB tablets in the class would include the Acer Iconia Tab A500, the Acer Iconia Tab A200 and the Toshiba Thrive AT105. At the outset, the Dragon Touch R10 presents itself as a sleek and attractive device. The tablet is a modern patterned silver and black design, with nice rounded corners, and an easy to grip set of sides. The tablet presents itself like any first generation Google product: it gives off that new “Star Trek” vibe while looking technologically capable and exciting. Looking at the rest of the face of the model we can see a front-facing camera and a rear facing camera–both offering around 2 megapixels in quality. This kind of quality allows for the capturing of great photos and clear video while you are on the road. Looking past the cameras we can see that the Dragon Touch R10 offers a slew of connection options along the side of the device. This is where the Dragon Touch begins to separate itself from the other entry-level tablets on the marketplace. Looking at the Apple iPad as the standard in entry-level tablets lets make a fair judgment on what exactly the R10 offers. Where the iPad offers only one port of connection, through the iPad docking cable, the Dragon touch has 2 full-size USB ports, 1 micro USB, and an HDMI output, that allows you to port out the video up to 1080P. This HDMI output means that your tablet could become the centrepiece of your home entertainment console as well as just a travelling companion. Let’s look a little bit closer at the media features that are offered here. The Dragon Touch is a tablet that supports flash and along with that opens itself up to a whole bunch of programs to make your mobile life more enjoyable. The fact that the Dragon Touch R10 can run programs such as Netflix, coupled with the HDMI output, means that your tablet is very much a mobile movie library. This is a great feature for the people always on the go. This device could be taken to any hotel room while travelling or used on an aeroplane and you will have all the world’s movies right at your fingertips. Movies are not the only thing that the R10 offers. The R10 comes installed with Google Android 4.1 OS (or Jelly Bean) and houses 8gb of internal memory. There are microSD slots that allow you to expand storage up to 32gb. Those that love to load their tablets with movies and music would be wise to check out the SD expansion so as to maximize what it is they are able to do with their machine. Past straight up storage I noticed that the R10 has a gig of ram and runs off of a 1.6 GHz dual-core processor. For something that fits almost in the palm of your hand this machine packs a serious kick in the pants. Technical specs are only so impressive to read when compared to the actual performance of the machine. What the Dragon Touch R10 has going for it is mobility, beauty, and power all rolled into one. The R10 has a 10.1-inch multi-touch screen that has colors that pop off of the screen. The tablet is just very vibrant and being that its target audience is the casual user, this goes a long way towards selling the machine. As far as fitting in the palm of your hand, the machine is also seriously lightweight. Fully loaded the Dragon Touch R10 clocks in at under twenty ounces. The Dragon Touch R10 fits comfortably inside of a backpack or side bag and is sturdy enough to be thrown around a little bit, not that I would suggest doing so, which makes this a great starter mobile tablet. In the grand scheme of things, the Dragon Touch R10 is a nice little machine that offers great flexibility with optimized features. While it won’t be as powerful as some of the other mobile tablets on the market, it makes up for that punch with sheer usability. The R10 will find its place in the homes of those that are wanting a less expensive tablet to compliment their other technology and for those first dipping their toes into the style of technology. The R10 is the perfect device to balance power, playability, and a low price.